Post is sponsored by Teleflora. What do you get the person that has everything? We all have those special people in our lives who are insanely impossible to shop for. I don’t know about you, but I enjoy giving gifts that have meaning behind them, so I reluctantly spend my days looking for that special gift. 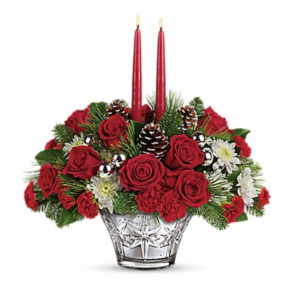 Teleflora makes it easy to give the perfect Christmas bouquet to our loved ones without all of that hassle. 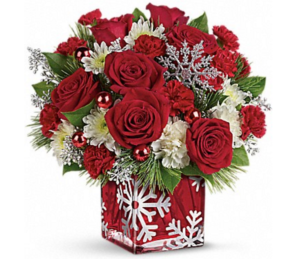 Send a hand-delivered bouquet from Teleflora and give a thoughtful gift that will add plenty of holiday cheer. 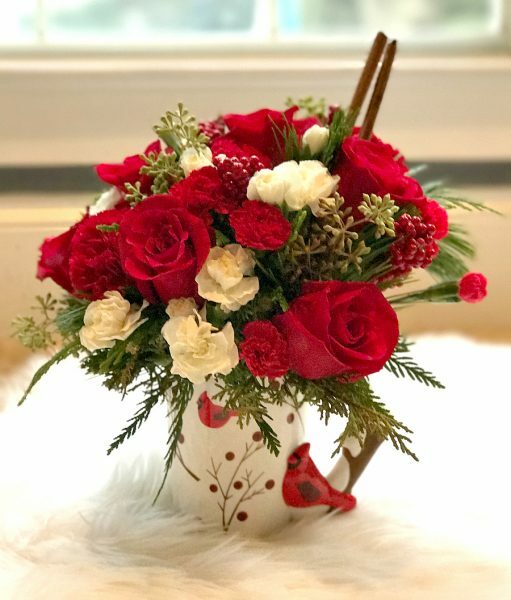 Teleflora bouquets are professionally-arranged by a local florist, and presented in a beautiful keepsake holiday container. The joyful bouquets are a heartfelt reminder of you. Teleflora’s Sparkling Star Centerpiece adds sparkle to the holiday table. Teleflora’s Snow Day Bouquet 2-in-1 floral gift also doubles as an adorable holiday cookie jar. 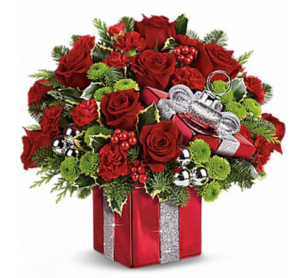 Teleflora’s Gift Wrapped Bouquet is a holiday crowd-pleaser for everyone on your gift list. 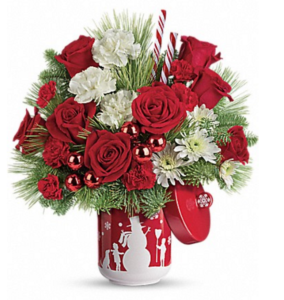 Teleflora’s Silver Christmas Bouquet the classic red cube vase features dancing snowflakes and glittering snow. 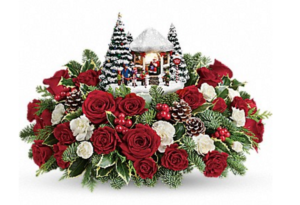 Thomas Kinkade’s Jolly Santa Bouquet tribute to Thomas Kinkade, the Painter of Light™. Send a Hug® Christmas Cardinal Bouquet in an oversized mug is adorned with hand-painted crimson cardinals. 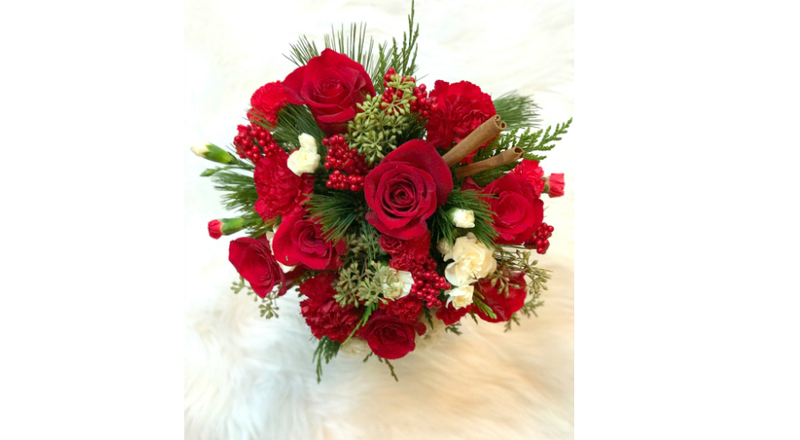 I received this beautifully hand-arranged Christmas Cardinal Bouquet floral bouquet from Teleflora. It is a stunning bouquet that arrived fresh to my door. The perfect centerpiece for the holiday season. Disclosure: this post is sponsored by Philips. All thoughts expressed are my own and may not reflect those of others. 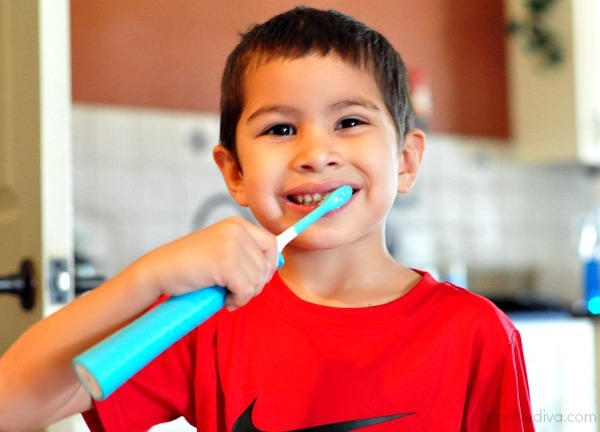 Every morning I order my boys to wash up, brush their teeth, comb their hair.